We were 90% sure it was gone. At one point this week, we were 100% sure. Through an old e-mail address, a missed reminder to pay for server space, and a dash of travel confusion, the Schooner was deleted. Unfortunately, just a few days earlier, we’d also deleted our back-up of it. Let this be a lesson to never delete your back-ups, no matter how chockas your external hard drive may be. There was an old back up from a year ago back in Australia (somewhere…) but that was no good for us, seeing as we were in Ireland. Long story short, there was a back-up after all! My brilliant partner uploaded it and with a grin and a proud “you’ll never guess what I found!” gave me back my blog. Hooray! Not a post missing! She’s quite the genius, and it’s because of her I started the blog in the first place. So filled with enthusiasm, I’ll crack on! Why is that kettle full of white flakes? As with ginger beer, Europe has harder water than Australia, at least in my neck of the woods. The white stuff is minerals in the water that have calcified, forming hard white stuff called limescale or calcium carbonate. It’s not too pretty to look at, but it’s pretty harmless to drink. After all, you drink it whenever you drink the tap water, it’s just all invisible making it less gross. I’ve been cleaning the kettles with some detergent and a brush to get the worst of it out, and tipping out leftover water when the white stuff starts floating about. Apparently boiling a bit of white vinegar in there does the trick too. Ah, the cleaning power of acetic acid. And it’s delish on fish and chips! Arr, it be talk like a pirate day yet again! Be sure to get yer pirate talk on, mateys, and make the most of this special occasion! Sadly, there ain’t be much happenin’ in Lubeck, where I am on this fine day, but even without an official parrrty I will be celebratin’ all the same!. 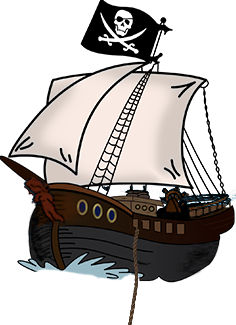 All yer tips on speaking right, events ‘n even knitting piratey treasures can be found on ye olde official site, Talk like a Pirate Day. Tomorrow I’m going down the west coast of the US, so please point out any poignant science spots on the way. I hear there’s some cool fault lines near Las Vegas, big trees near San Francisco, and vampires in Forks. I need some encouragement to keep the blog updated while I’m gallivanting about – if you want to read more about something, please poke me by posting a comment. It’ll help me get to the fourth birthday. Thanks for stopping by and reading, hats off to ye. One major project the Square Kilometre Array (SKA) will be working on is first light, how light arose in the Universe. A quick recap on the SKA: It’s a radio telescope 10,000 times more powerful than current models. Made up of dishes linked to a data processing unit, the instrument will stretch at least 3,000 kilometres across Australia or Africa. My last post talks more about the SKA itself, what it is and what it means for science. But now let’s talk about first light. But before the earth began to cool and the autotrophs began to drool a lot had to happen. 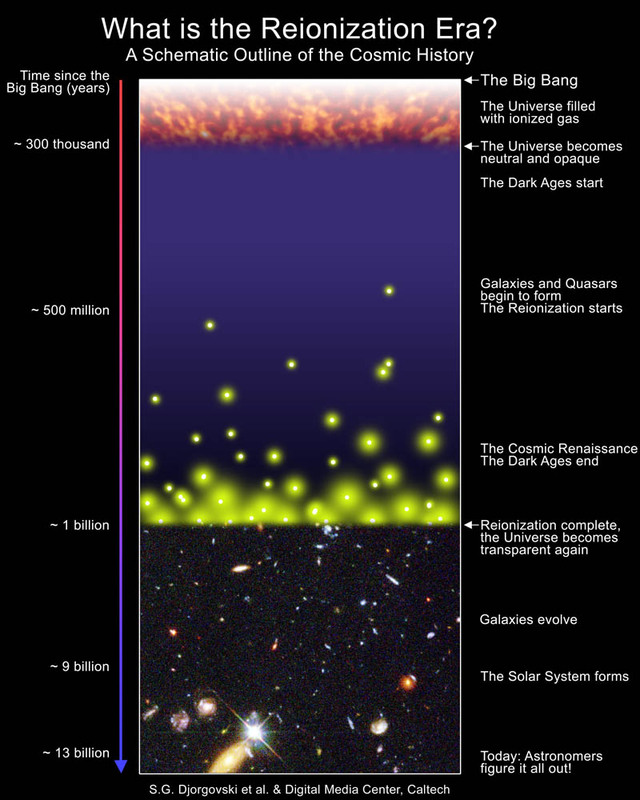 The creation of stars, galaxies, and all things seen and unseen has taken billions of years. By observing cosmic microwaves we can study how the universe looked at the age of 300,000 years, smooth and uniform. Through telescopes we’ve looked back to when the universe was a billion years old, as protogalaxies merged into galaxies. But between those times, we know very little. This period is called the dark ages, before stars were formed and started to shine. First light is the end of the dark ages, the moments when the first protogalaxies and quasars came into existence. How can we look back six billion years to first light? Telescopes are time machines. Look at something near you right now, say a pen. What you’re really seeing is light bouncing off the pen, travelling through the air to your eyes. Light moves very fast, but it’s not immediate. It takes a fraction of a second for the light to reach you. The further away you look, the further into the past you gaze. I always imagine what has changed out there in the thousands of years the light has taken to reach us. Is that star still there? Is it in the throes of death, spreading out into a supernova? First light, then, though it happened long ago we can still see it happening in celestial newly-forming bodies that are very, VERY far away. Distant and only faintly glowing protogalaxies defy current telescope technology. Finding first light is heralded as the next frontier in cosmology. Here’s more about the SKA projects. Here are some notes gathered at the Inspiring Australia conference on how to write good science stories. This is all about public relations and writing a good media release. There wasn’t much about creating a narrative, or fact-based fiction work, or creative non-fiction. If anyone can recommend a good source for that stuff I’d love to hear it (leave a comment. – What’s the impact. Find an analogy – don’t say megawatts, say how many homes you can power. People get that. – Use drama if possible. Don’t exaggerate it, but if something is truly exciting or dangerous, recognise it. You can tell a story, but still be credible. – Ask yourself: What is the story and why am I telling it? Who will hear the story? What are the tools I have to tell the story and how will I use them? – You need a GREAT story if you’re going to tell it, then you need to work out how to connect it to the audience. We’ve all been to very good factual presentations that bored us to death. You have to get entertainment in somehow. – Science communicators are very verbose, and sometimes over-explain things. Use more silence and reflection time.